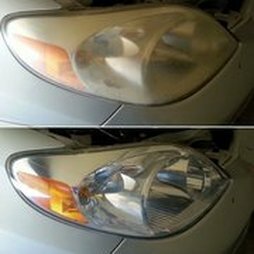 Restore your headlights like new for only $50 each! Looking to fix your oxidized headlights? 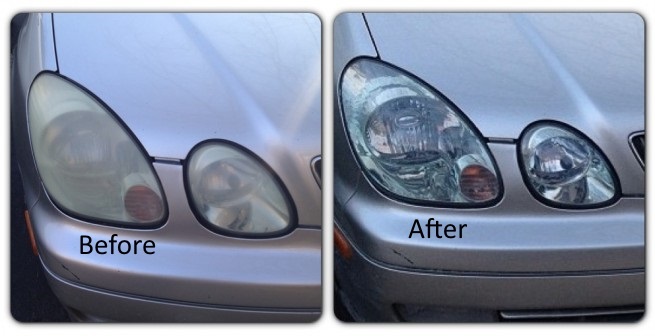 Don't waste hundreds of dollars on buying a new pair when you can spend just $50 each at Louisville Mobile Detail and have your current headlights brought back to look like new. Clear coat is stripped and the polycarbonate plastic is over exposed to the sun causing it to crack and burn. The rubber seal holding the two pieces of plastic together is weathered or cracked causing condensation and burning of the inside of the headlight. In order to clean the headlights, most companies will charge an arm and leg to sand the remaining clear coat off and add a new clear coat layer to it. More often than not the only thing your headlight needs is a special polishing compound designed to strip the chemical stains and re-polish the clear coat surface back to the original shine. The only time the headlight needs to be sanded down is when the clear coat has been stripped over time and the plastic itself cracks and burns. Then the headlight needs a new layer of clear coat. Don't let anyone convince you of another false method or product. Just call Louisville's most trusted detail shop or set an appointment with our contact form and have your headlights looking like new again.